I saw Mama frowning and shaking her head and looking to Papa to put a stop to this improper nonsense, but Olga, usually so reserved, was skipping merrily around the dining rooming the arms of a tall, bearded peasant as though she'd been practicing for just this moment. It didn't take long for Marie and me to have partners as well, young boys with pink cheeks. Only Tatiana held back, sharing her head, until an older man with a grey-streaked beard stepped forward and swept her away, too. I loved swirling past the members of the imperial suite, the noble ladies and gentlemen who traveled with us, and seeing how aghast they looked, as though they smelled something slightly off. Tatiana, Marie, and I rose obediently and started to leave, but Olga didn't move. For months Olga had said little, dispirited and sunk in her own thoughts. Now suddenly she rebelled. "We want to know what's happening," she announced. "We are no longer children. We might have been 'girlies' in Tsarskeo Selo, but we are not 'girlies' in Siberia - not any of us, neither Tanya nor I, and not Mashka, and not Nastya, either. And Lyosha, too, must know - he's not "Baby.' These months as prisoners have made us adults." The world is a dark, dark place. Our family now wrenched apart, parents and one sister taken away, who knows to where, for what purpose? Tanya stands ready to keep us going here until the next terrible thing happens. She's so much strong than I am. Even Nastya is stronger. Father and Mother continue to cling to the belief that we will be reduced, somehow, by someone, but who? I have no hope of rescue. I have no hope of anything good happening. The only hope I have is that I am wrong about everything. I don't think I'll ever read enough books about the Romanov family - especially when it comes to the Grand Duchesses. Carolyn Meyer is no stranger to turning the stories of historical characters into works of fiction (she does stick close to the facts but also takes a creative license when telling these stories), nor is she a stranger to Anastasia Romanov having years ago written Anastasia: The Last Grand Duchess for The Royal Diaries series roughly 15 years ago. Having read that novel way back when, Beauty's Daughter: The Story of Hermione and Helen of Troy last January, and having two additional novels of Carolyn's on my self I knew I couldn't pass up her latest installment. 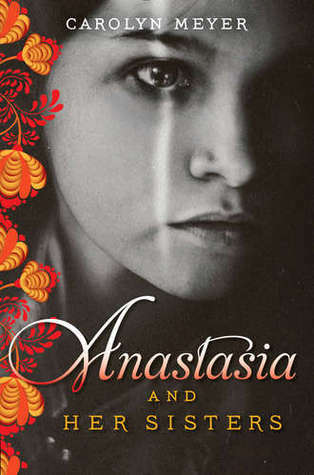 Carolyn tells the last years of the Romanov rule through Anastasia's eyes as she is probably the most well known of the sisters, a fact we can most likely thank all the imposters claiming to be her and having survived the massacre of her family in 1918. The novel beings in 1918 as Anastasia, two of her sisters, and a family friend "dispose of the medicines" - their code for hiding their jewels by sewing them into their clothing - before backtracking to the year 1911 and coming full circle. We spend seven years with the Romanov family and Anastasia's voice grows and changes throughout that time. She goes from talking about her hatred of school and dreaming of balls to understanding that things are not right in Russia even though she doesn't fully grasp what this means for herself and her family. Her thoughts go from surface level to deeper thought and it's this growth and development that adds to the reading experience. Every time I read a novel about the Romanovs it's hard not to feel emotional. By adding a certain level of depth and characterization, Caroyln makes the emotion even stronger. We're not just reading about their exile, we're feeling their exile. We're sitting in Tobolsk, staring out the windows to our friends in the house across the street but able to talk with them; we're at Ipatiev House with only a half hour of daily exercise in an enclosed garden and our windows painted over to keep us isolated. This isn't a nonfiction biography that spews out facts (don't get me wrong, love those too), but a historical novel that gives these characters life.